When Kim pulled the van into the driveway, I could tell by her expression that something was wrong. She was returning from taking our boxer to the vet. But her words didn’t sink in. Until I took my oldest daughter for a drive later this evening. I waited until we’d passed through our neighborhood before saying anything. She’s old enough to know when something is wrong. “Elka is sick”, I tell her. I veer off the exit heading towards HWY 18 and into unchartered territory as a father. How do I tell my child the that only dog she’s ever owned has a brain tumor? We brought Elka home a few months before we found out we were expecting our first child. That child now wants to know what’s wrong, yet I sense she doesn’t really want to know. Because she already knows. “How long will she live?”, she asks. That’s the unknown. Nobody knows how long she will live. We know the tumor has grown enough that’s it’s making her right eye bulge. But that’s it. It’s like someone gave me a grenade to hold. I know it’s going off. I just don’t know when. 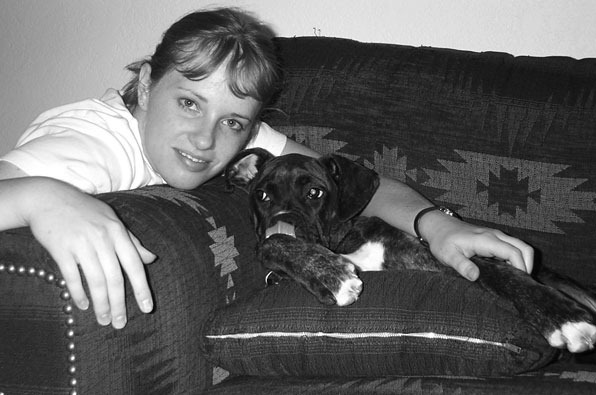 Elka was about 1 years old when this picture was taken with Kim. I try to keep my composure. I take a deep breath. And then another. I know what I want to tell her but the words will not come out. And if they do, I know my emotions will drown them out. The last thing I want to do is upset my daughter. In my mind, I repeat what I want to tell her. I’m glad it’s dark so she can’t see my face. “I don’t know how long she will live. The vet will tell us more on Tuesday”, I say as I look straight ahead. I don’t know what else to say. My head is spinning and my mind is numb. I understand this is part of bringing a pet into our lives. The first few years are spent training and getting acquainted. Those four to six years after that are some of the best. She knows us and we know her. She knows our routine, and there are few surprises. She’s young enough to rough-house with our young children. Of course, they adore her. But I wasn’t prepared for this past year. Watching her avoiding going up or down steps. Stretching her stiff limbs and retreating to a quiet corner of the house when the kids get too rowdy. And then the grenade handed off to us tonight by the vet. We find out more on Tuesday, but her prognosis does not look good. We knew that tumors hit boxers as often as any breed. We signed up for that. When I returned from racquetball tonight, I looked up towards our living room window. Elka was there waiting to greet me. Her body shaking back and forth. Like she’s done hundreds of times. All I ask God for is a few more. Sorry to hear about Elka. I’m glad I could lift your spirits a little tonight with some treats.